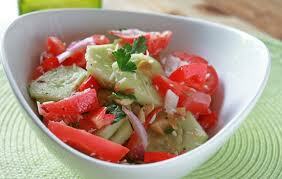 This is a delightfully easy and refreshing salad. When I’m in the mood for a salad but don’t feel like cutting and washing lettuces and a million other things, this is my go-to. It is most appropriate in the summer months, but due to the ‘brine’ marinade, I qualify it as a winter salad too. And the seasons don’t matter when good food is at hand, or you live in southern California. I say ‘brine’ marinade because a brine is what gives us pickles. Sugar, salt and vinegar are the basis. They inject their flavors, leaving a crunchy, sweet/sour, and somewhat preserved product. It replaces any homemade or store-bought dressing, is easier, and imparts a great flavor. And, in this particular case, is all you need to make the ingredients shine. Again, this is a basic recipe. Some versions will call for fresh dill. Others, sour cream. To make it Japanese, use rice wine vinegar, mirin and soy. Koreans will also add some fish sauce and lots of dry/fresh chili peppers. Obviously, the versatility is there, and you can do what you want with it. I prefer it simple and refreshing. Cut the tomatoes in quarters, the long way. Run your knife under the seeds and pulp. Discard the seeds and pump and chop tomato ‘petal’ into roughly 1/2 inch pieces. Place in a mixing bowl. Slice the cucumber as thin as possible (a mandolin works best). If using a knife to do this, make sure the knife is very sharp and take your time – the thinner the better. Same applies to the onion. Slice it julienne style as thin as possible. Place everything in the mixing bowl with about 2 tbsp cold water. Taste it and adjust it if necessary. It might need a little more vinegar, sugar or salt. Cover and refrigerate for 1 hour. Drain the brine and serve right away.